Truly a high point of 1983. 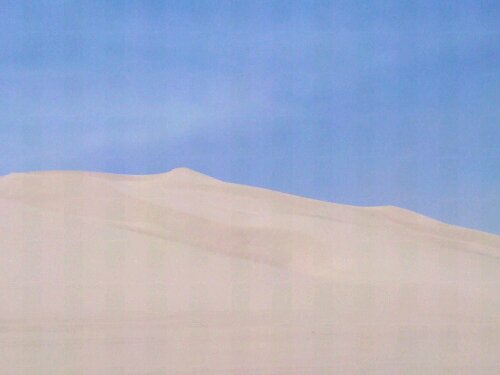 GeekDad has published my two-part recollection of seeing the final chapter in the original Star Wars trilogy on opening night – 30 years ago this weekend. Lapti Nek and Yub Nub forever. More Len Peralta! More Star Wars! More Nerditry! And Airwolf! 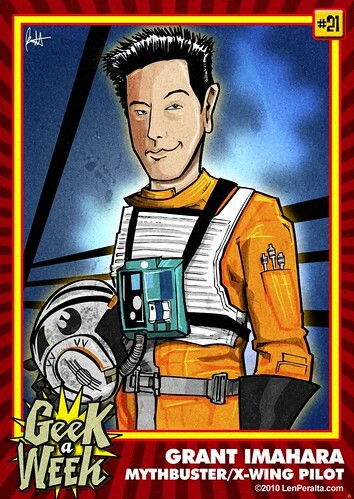 Two weeks ago, I posted Part One of a Super Geeky Star Wars Nostalgia Podcast with Cleveland artist Len Peralta, creator of Geek A Week and the new 50 vs. 50 Heroes & Villains Mission. Quest. Thing. Here’s Part Two, in which we discuss not only the merits of Kenner’s Return of the Jedi toy line, but the art and craft of boombox television recording, reliving Star Wars before you could watch it on TV any darn time you wanted, and lame Halloween costumes. Also, it turns out Len does an impressive Artoo-Detoo impersonation. These cakes are no lie. Just LOOKING at all that icing makes me hyper. 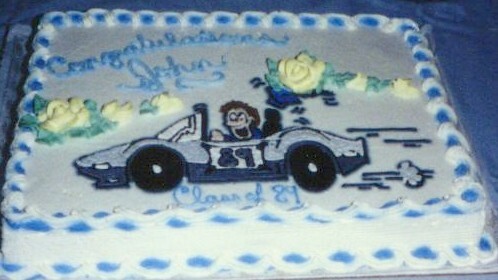 Cars, cartoon and cake. Trifecta. 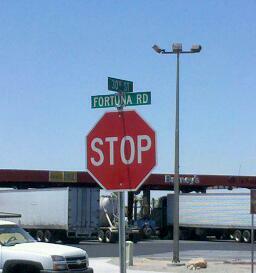 Yes, it’s goofy, but this picture just unleashes a torrent of memories for several reasons. First, it’s from my 1989 high school graduation, and I wrote a few essays last year looking at various aspects of why that year still holds meaning for me more than two decades later. third, that’s a cartoon drawn by my old buddy Transformers / G.I. Joe / Gumbo creator extraordinaire Aaron Archer, back when he was still in high school. I’m pretty sure this photo is one of just two surviving Archer “portraits” of teenage me. 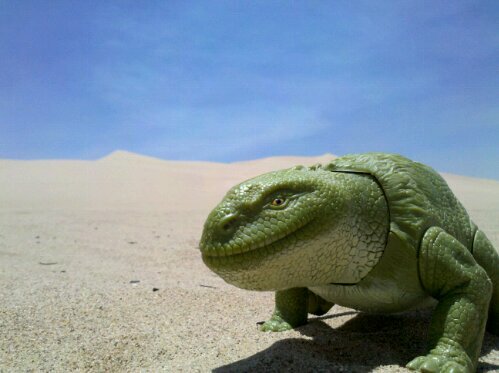 Star Wars nostalgiarchaeology – delicious find! 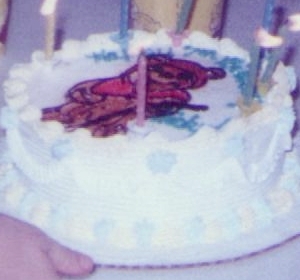 My friends, if my analysis is correct … that is an EWOK on that ice cream cake. 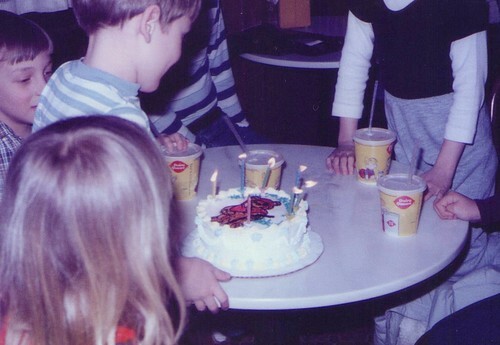 Short help's better than no help, but ice cream cake beats all. 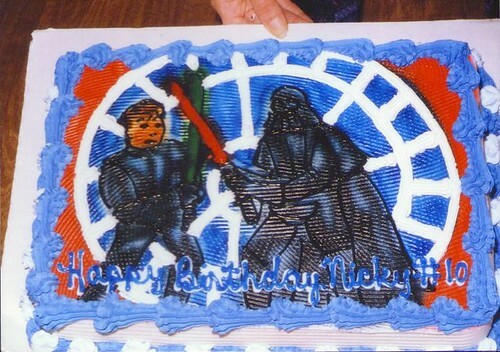 Now, I remember Nick’s Return of the Jedi Throne Room Duel cake, but this one had completely eluded memory. If I had to guess, I’d figure this was in the Dairy Queen adjacent to the Gold Circle department store on Everhard Road in Canton, in the same shopping center as the four-house movie theater and the Funway Freeway arcade where Aaron and I fought Golden Axe to the death. Given the amount of time and energy I’ve spent digging up pretty much every corner of my Star Wars Memory Yard, it’s fun to find something like this. A few weeks back, I had to log off the computer and go downstairs to deliver some news to my daughter. So, ten-odd hours from now, we’ll be gearing up for the midnight(ish) premiere of the sixth Harry Potter movie. I’m excited, but even though I love the movies, the anticpation is more about the opening night experience. I realized over the weekend that while I’ve seen my share of opening night movies – seeing Return of the Jedi (archived on an old Field’s Edge page) the day it was released remains my all-time favorite cinematic memory – I don’t think I’ve ever gone to one of these overnight shows, so it will be a first for both of us. Double-checking the ticket confirmation online yesterday, I noticed there are now five just-after-midnight showings at the theatre we’re visiting, and they’re all sold out, which should make for a pretty buzzy atmosphere.